A character bears exactly two tails. 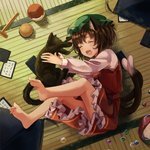 Touhou's Kaenbyou Rin and Chen both bear two cat tails. Only use this tag if both tails can clearly be seen. This tag implicates multiple_tails (learn more).